We recommend you export contacts regularly to back-up your subscriber records. It's also a good idea to export contacts before you proceed with any major email list changes. All exports are delivered via email as download links for .csv or xls files. Click on the List Name you'd like to export. If you wish to export the entire list, click All Subscribers. Choose whether you want to export your file as a CSV or an XLS format. Click Export to confirm and process your export. We will email you the link to your file. Note: See below if you have issues with the export link. 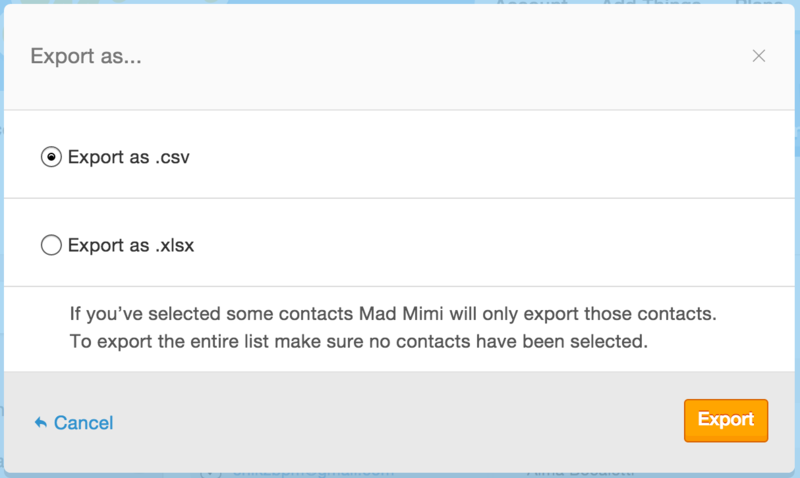 Select the list you want to export, or choose specific contacts (using the checkboxes). Click the Export button in the top right of the page. We will let you know that the export was successfully created, and will email you when it’s done. This usually only takes a few minutes, but can take a bit longer with larger lists. Once you select that option, you’ll be able to choose a name and location to save the file. Naming the file with a .csv extension (like: "Export_Name.csv"), or a .xls extrension (like: "Export_Name.xls"), is the best way to ensure that the file will open correctly in the right program on your computer. Depending on which file format you chose when you exported from your subscribers will determine which extension you should use to save your file. Voila! You have a file with those contacts in it on your computer, and you should be able to open and edit it with any spreadsheet or text software program. How Do I Add New Contacts?